Many people assume that there’s no need to start treating their lawn until “spring” when the trees and flowers are blooming in April. Warmer spring temperatures bring your lawn out of dormancy and begins an active growth cycle. Unfortunately, that means crabgrass will be germinating and growing too! Pre-emergent crabgrass weed control applications are an important step in annual lawn management. However, choosing the right timing for the application can be tricky, and bad timing will only result in a waste of time and money. • Mow at frequent intervals to keep the grass at a consistent height- we recommend 3.75 to 4 inches for tall fescue. Crabgrass seeds require plenty of light to germinate, so keeping the turf thick and tall will keep any weed seeds at the soil surface in the dark. Mow too short, and weed/crabgrass seeds will grow, well… like weeds. Also, be sure to keep your mower blades sharp so that they CUT blades of grass, instead of tearing. You can bag clippings if you like, but we recommend mulch mowing and leaving the clippings in the lawn- they help restore nutrients to the soil as they decompose, and can help to block sunlight from those pesky weed seeds lurking on the soil surface! •In an established lawn, water deeply once or twice a week this spring and summer, instead of daily. Watering on an irregular schedule and only when needed promotes deeper root growth that’s essential to healthy turf grass. Remember, the goal is a few gulps, not several sips. The only time you’ll want to water frequently, is if your lawn is newly-seeded or sodded: then, you’d water in shallow, more frequent intervals just until the grass gets established before weaning it back to once or twice a week. Not sure how much is enough? We recommend at least one inch of water a week, once the rainy part of spring is over. Because every sprinkler system flows differently, the easiest way to measure an inch of water on the lawn is to set a clean, empty tuna can on the lawn and run your system. When the can is full to the brim- that’s one inch of water. Write down how long you had the system running to water that amount, then you can program your system for the same amount of time, once (or twice) a week! If you’re concerned about crabgrass ruining your lawn, call us! The first two rounds of our Basic Program of fertilization & weed control include crabgrass pre-emergent. Kill crabgrass now. 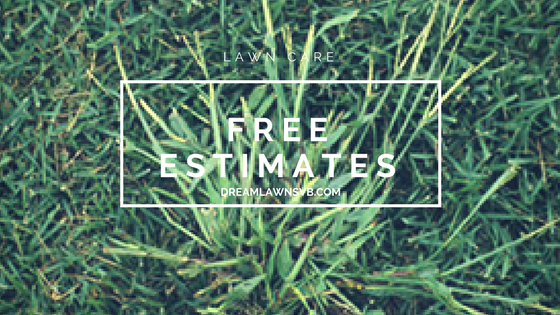 Call on the areas best lawn care company Dreamlawns & the locals #1 choice in lawn treatment. Previous Previous post: Looking for the Perfect Gift?